Actually it is quite hard going – each of the fifteen chapters is a very intense stand-alone piece, and so I find I need long breaks between each chapter. Each chapter addresses a musical tradition – last night I read the chapter on South Indian music traditions. In the introduction, Church addresses some of the problems with the “classical” label, talking about “great music”, authority, formal discipline, models of excellence. So last night I also pulled out Matthew Gelbart’s The invention of “folk music” and “art music” (Cambridge University Press, 2007) to remind myself of the contingent or particular nature of these ideas. Gelbart very coherently and convincingly argues that these concepts are specifically North-West European inventions of the late 18th or early 19th century. He also points out that we have a third category as well now, of “popular” music. Church barely mentions “popular”, implying it is equivalent to “folk” (p6). I thought of this when I was looking at the photos of South Indian ensembles, with vocalist, drum, drone-lute and Western violin, all of them playing through microphones and amplifiers. The violin seems incongruous because it brings a hint of the Western classical tradition, though it’s clear that it is used in an entirely indigenous way. The microphones seemed more disturbing – “amplification is almost de rigueur in all but the smallest venues…” (p.168), and then I realised how subtle and insiduous these categories are. I think that I could accept the violin because it was a sharing between “classical” traditions, but the microphones seemed too “popular”. Church’s book is really valuable to me because it is so ferociously ethnomusicological – each tradition is described on its own terms as a standalone tradition, respected and understood from an insider perspective. Though comparisons are drawn with mainstream Western practice, these are usually illuminating to a Western reader and not too intrusive. The problems of trying to categorise traditions as “classical” as opposed to “folk” or “popular” hangs over the project, but the individual articles do rise above that in general. Boyd Tonkin, writing in the Independent, says “I wondered if the courtly and refined traditions of Ireland, Wales and Scotland might have warranted a chapter.” And I think this might be a good challenge, to think about the model framework to which each chapter in the book adheres. How would we describe the old Gaelic music in that way? 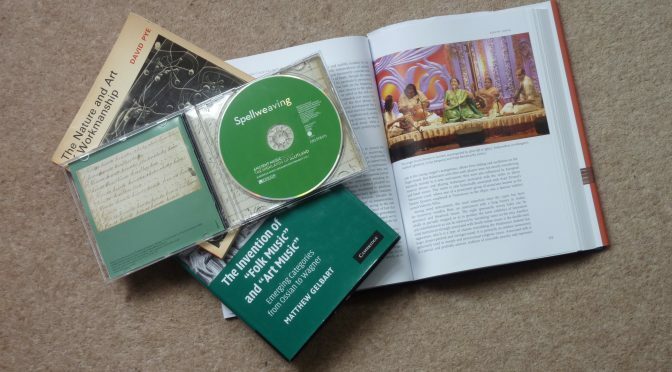 I also thought about these issues when I got copies of Barnaby Brown’s latest CD, Spellweaving. In the past Barnaby has referred to this music as “classical Gaelic piping”, and I am interested in the idea that ceòl mór, and indeed Gaelic harp music, is not a “folk” tradition. When I lecture for the MU2002 Scottish Music undergraduate course here in the University of St Andrews, my lecture on the harp traditions is put as part of the “folk” stream, whereas my lecture on the 17th century lute books was put in the “classical” stream. Every time I give the harp lecture, I start by explaining why it is not a sensible categorisation to describe this harp and its music as a “folk” tradition. I thought when listening to the CD, what does it signify if there is an attempt to position this music as a “classical” tradition? There is the implication of seriousness, that the music deserves intellectual engagement, that it is not just new-age background ambience. But I also thought of Church’s “formal discipline”. Is there a “right” and a “wrong” way to do this stuff? The mis-match between the adventurous instrumentation on the CD, with the way the musicians obsessively follow Barnaby’s written transcription / arrangement of the late 18th century manuscript source, seemed to highlight these problems. Church comments on the problem of notation, the “death-knell of for the old improvised forms”, paraphrasing Theodore Levin: “…frozen music, with students made to reproduce officially-approved performances with slavish fidelity down to the smallest ornamental detail” (p.12). Obviously notation is key to re-imagining old Gaelic music, but addressing these issues and moving “beyond the text” is essential, I think, in getting to grips with this stuff. Most noticeably at odds with this “high” tone was the harp playing, with the small, modern harp, set up without na comhluighe, and played back-to-front, giving a very different approach to this tradition from Barnaby’s exacting archaeological replica of the 17th century “Iain Dall” chanter, or the lyres copying archaeological exemplars and set up in response to physical features of the originals. This seems especially incongruous on a production of the European Music Archaeology Project. There are such riches of extant early Gaelic harps in the museums in Ireland and Scotland; so why use a modern re-invention, instead of a good archaeological replica? But in the end, I think art is totally arbitrary; each person expresses their inner life through their actions, and their acts and statements are free-floating and self-authenticating. A “tradition” is no more than an aggregate collective of individual creative acts, and so itself is a contingent and rather arbitrary thing. I suppose what interests me most is the tension between being too conservative, and too radical. Too conservative, and the artistic statement is not of any interest, it is boring, it has been done too many times before, there is no human engagement and so it fails. Too radical, and there is no possibility of comprehension, no hooks with familiar concepts, no shared language or structure, and so it becomes incomprehensible randomness, there is no human engagement and it fails. David Pye, in The Nature and Art of Workmanship (1968, Studio Vista edition 1971) talks about the limits of (visual) perception, with some aspects of the perceived thing being clear to the eye, some too small to clearly see, and some too big. He implies that the engagement and fascination happen at those limits, where the eye and the brain are teased by the almost – comprehensible. Is this what traditions and categories of “classical” and “folk” do? Do they give us clear views, starting points from which we can move away to find those not-quite-graspable regions at the limits of perception?